A busy class IV run in a lush forest with a couple large waterfalls thrown in the mix. Shuttle: There is a shuttle that requires driving up over 3,500ft. and a 2 mile hike in, but at the end of the day it’s quicker to hike up 4 miles from the take-out at the bottom. Hike up, boat down, and drive out. Put-In: Upper Siouxon Falls just downstream of Calamity Creek. Take-Out: FR 5701 West Creek Campground (about a quarter mile hike to the campground and the water from the trailhead). I’ve been patiently waiting on Siouxon since my last run on that creek. I’m not sure why, since the first run seemed like a brutal beat down with little whitewater pay off, but during the early season it’s good to get a couple adventurous beat downs out of the way..
My hope for going back in was to start very early and make it out with daylight to spare. I met Lousi Geltman and Michael Gotlieb at 7am and we were headed to the take-out. Louis convinced us to hike up from the bottom, 4 miles, and not have to deal with shuttle. I reluctantly agreed, but that method turned out to work great. We did the hike along with scouting in about 2 hours and had plenty of time to pick apart the rapids and falls. Middle Siouxon Falls – On the high side..
We elected to portage the two big one’s this day.. Upper Siouxon had some new wood on the left side of the pool and Lower Siouxon is going to be a wild ride for whoever drops in there. We made it to the take-out at 2:30pm. The Flow on the East Fork Lewis was 2,600cfs and dropping. 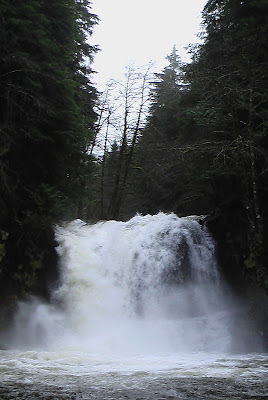 Lower Siouxon Falls – Louis scouting..
Nate Herbeck, Jesse Becker, Jarred Jackman, Chris Bolken and I made the early morning drive leaving Hood River at 5am to run Upper Siouxon Creek. The water levels appeared to be leveling off that morning, but as it poured rain all day on us that was not the case. With 1,450cfs on the E.F. Lewis gauge it rose to 2,000 by the time we took off. We had a two and half mile hike in and were pressed for time. The unknown of what lie downstream hit us around each corner. Jarred ran this big 30+ footer, Middle Siouxon Falls, as we thought our day was coming to an end. At the begining of the trip we all thought we had 2 miles of creek to complete the entire run (always read the fine print). After about 3 miles we came to a 40+ foot, technical cascade and started questioning if we had missed our take out. As we paddled downstream the entire crew was feeling the day. You know that feeling where just pushing yourself up out of your boat in the eddy is painful and you pray that all you have left is read and run downsteam all the way to the take-out? We made it to the take out just after dark, hiked up the 1/4 mile trail to the parking area to find two other kayak rigs parked there. My first thought….”Damn, I feel sorry for those guys.” They made it out shortly after we did. More info for this run can be found on Oregonkayaking.net and look for more updates on this one in the future as it is in the personal top 10 list now.